Intel made a splash when it launched its first solid-state drive (SSD) last year: Its models delivered the best performance we'd seen on SSD to that point. 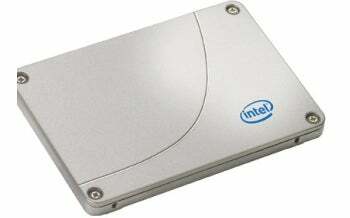 The company today announces its second-generation drive, the Intel X25-M Mainstream SATA Solid-State Drive (SSD). This new 2.5-inch drive, available in the same capacities as before -- 80GB and 160GB -- uses smaller and less expensive 34nm NAND multilevel-cell flash memory, which translates into big cost savings for consumers. The previous X25-M used 50nm flash circuits. Intel says the new iteration has improved on some aspects of performance, with up to a 25 percent reduction in latency (which translates into greater speed for accessing data); Intel says a standard hard drive's latency spec would be at 4000 microseconds, while the new X25-M carries a rating of just 65 microseconds. The new drive also has faster random-write input/output operations per second (IOPS) compared with the first-generation model: It's up to two-and-half-times as fast for the 160GB model, and two times as fast for the 80GB. Intel says the 80GB model can deliver up to 6600 4KB write IOPS performance, while the 160GB model can achieve 8600 IOPS. The drives also feature a similar boost in random write performance, which Intel says will translate into faster system and application responsiveness. Notably, Intel rates the life expectancy of these mainstream drives at 1.2 million hours mean time between failures. Only enterprise-class magnetic hard drives are given comparable ratings by hard-drive makers. The new X25-M models carry significantly lower prices as compared with the previous-generation drives. Now, the X-25M 80GB has a channel price of $225 (compared with $595 a year ago), and the 160GB version has a channel price of $440 (down from $945). Intel's price move is bound to make SSD a more affordable and viable option for consumers than it has been thus far. The X25-M drives still carry a price and capacity premium -- storage-hungry fiends will look to hard drives with more than triple the capacity, not to the Intel SSDs to satisfy their needs. But SSD has its strengths, especially if you're using it for disk-read intensive tasks. I anticipate more SSD makers will turn to the new flash chips to achieve competitive pricing with Intel; and the new pricing should help drive SSD adoption, which has been slow to take off over the past couple of years.